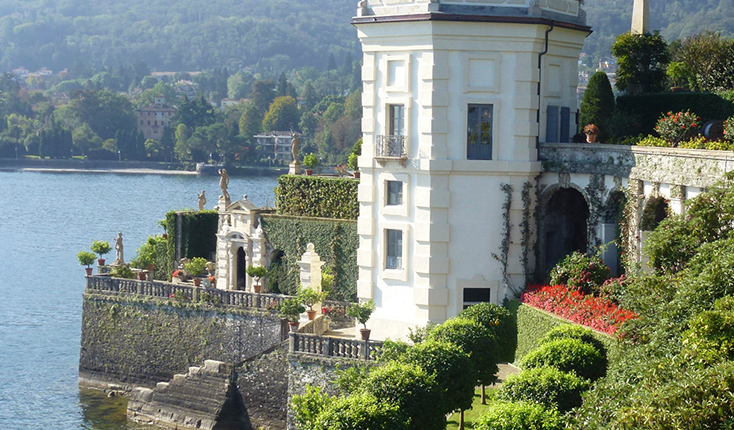 Concentrating on the wealth of beautiful gardens around Lakes Como and Maggiore, the tour gives a balance between interesting botanic gardens and those of classic Renaissance and later Italian style. The exuberant spring flowers are set against breath-taking scenery with many varieties of azalea, wisteria, cornus and magnolia – a spectacular yellow variety is particularly eye-catching. At the northern end of Lake Maggiore we cross into Switzerland to visit the impressive Eisenhut Botanical Garden and nursery. An insubric climate, acid soil and sunny cold winters enable the rich variety of plants found in the region to thrive. The first few days are spent on Lake Como at the delightful, family-run Hotel Firenze in the lakeside village of Bellagio, overlooking the beautiful lake and snow-capped mountains. 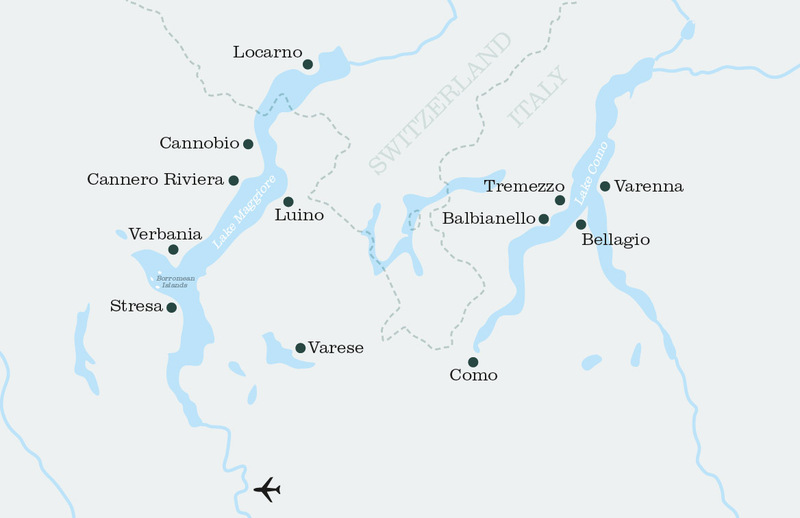 We then transfer to the very comfortable Hotel Cannero on the beautiful Maggiore lakeside, run by Signora Gallinotto and her family to a very high standard. Beat Fischer, our Swiss botanist, leads the tour with his usual enthusiasm. Beat was formerly curator of the University Botanical Gardens in Bern and has led tours for us for some years. Our group will have a maximum of nineteen participants. Travel between gardens is minimal and is by lake boat and minibus. Flights are arranged to Milan airport where you are met by Beat. The transfer to the hotel is along the beautiful coast of Lake Como. Late afternoon gives time to relax and discover the beautiful village. An aperitivo and short talk on the week’s programme is given before dinner together in the hotel restaurant. Beat Fischer, our leader, has extensive knowledge of the region with its gardens and plants and is an engaging communicator. Morning visit on foot to Villa Melzi with its garden along the lakeside at Bellagio. Built by Francesco Melzi, Duke of Lodi, in the early nineteenth century, it has extensively landscaped gardens with statues, a classic temple and an orangery; it is also well planted with mature trees and acid-loving plants. 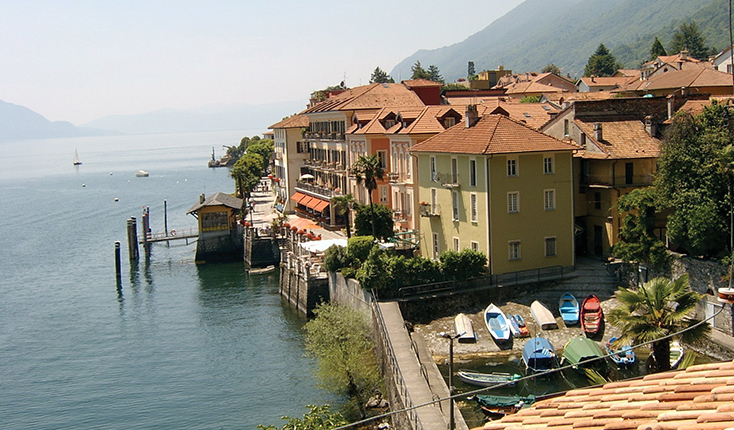 Cross the lake by ferryboat to the attractive town of Varenna. Lunchtime free. Afternoon visit to Villa Monastero with its superb terraced garden along the lakeside featuring cypress avenues, statues and balustrading leading to a coffee house. Return by ferry boat to Bellagio. Free evening to discover Bellagio’s restaurants. 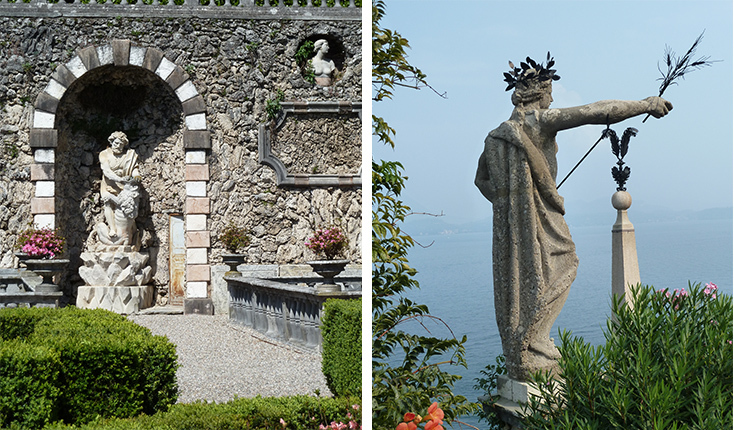 Leave by private boat to visit the gardens of Villa Balbianello on a promontory across the lake. A strikingly beautiful garden with candelabra-shaped plane trees, clipped holm oaks and tall cypress, it is dominated by an elegant loggia. The property was bequeathed to the Italian National Trust (FAI), and a guided visit of the fascinating interiors is included. Continuing by boat to Tremezzo, we arrive at Villa Carlotta. Guided walk around the extensive garden with its flowering azaleas and rhododendrons. Return by boat to Bellagio. Free evening (a reservation can be made at a local restaurant). 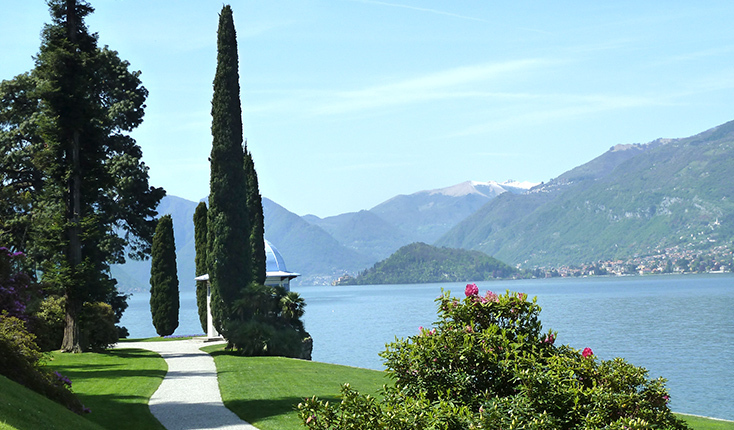 Depart by coach from Bellagio in the morning to visit Villa Cicogna Mozzoni and gardens at Bisuschio. The Renaissance villa and the gardens, with a celebrated water staircase, date back to 1560. The property has belonged to the same family for over 500 years and the current owner will show us around. We enjoy a delicious lunch in the villa. Taking the ferry across Lake Maggiore to Cannero we arrive at the hotel. Dinner together in the hotel restaurant. 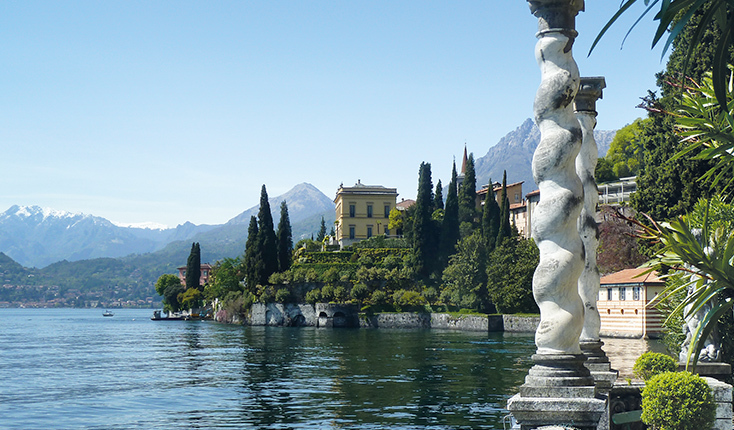 Taking the lake ferry, we visit the island of Isola Bella with its superb, theatrical Baroque gardens dating from the early seventeenth century. An architectural wonder, it was conceived to appear as a ship floating on the water. At lunchtime we arrive by boat at the gardens of Villa Taranto where light refreshments are available. The garden was created in the 1930s by Scotsman Neil McEacharn and features a superb collection of plants gathered from all over the world on a site of some 44 acres. On returning to Cannero tastings of Piedmont wines in the hotel cantina can be enjoyed before dinner. Morning visit to the Botanical Park and Nursery of Otto Eisenhut at San Nazzaro in Switzerland. Guided tour of the collection, one of the most comprehensive in Europe, specialising in magnolias, camellias, cornus and azaleas. Lunchtime in Ascona. We continue by lake ferry to the well-known Swiss botanical garden on Isole di Brissago with a rich collection of plants. We return by boat to Cannero. Morning visit to a delightful private terraced garden on the lakeside in Cannero. Originally a citrus orchard with a defensive tower above the attractive harbour, the garden is beautifully planted and the tower incorporated into a villa. We then leave for the Borromean island of Isola Madre, and a botanical garden with its own microclimate with citrus trees, mimosa and carob, high camellia hedges, cornus and azaleas – a magical garden. A huge Kashmir cypress grows by the Renaissance villa (which can be visited). Lunchtime on the island. Return to Cannero late afternoon for dinner featuring local specialities. After breakfast, we depart for Milan Malpensa airport for the return flights. All flights and transport in modern, comfortable minibus, lake ferries. Accommodation with ensuite bathroom, delicious meals as indicated, garden visits led by Beat Fischer, botanist. Tips. AAlcoholic and soft drinks (except the first evening’s aperitivo), items of a personal nature, comprehensive travel insurance with full cover to be taken out on payment of the deposit insurance. Both hotels are of a high standard and are on the lakeside. On and off ferry boats and a private boat. Terraces with flights of steps. The climate in late April can be sunny and warm, though heavy rain showers are sometimes experienced. Layers are recommended and sturdy shoes for the garden visits. Smart casual for the evening. Meals included are shown as B (breakfast), L (lunch) and D (dinner). Often guests meet for drinks before dinner (optional). Wifi is available in both hotels.